E.B. White (1899-1985)--author of Stuart Little, the 1953 Newbery Honor Medalist Charlotte's Web and The Trumpet of the Swan--is not only beloved as a children's book author, he was a true writer's writer. He called his own shots as a New Yorker columnist, wrote poetry and essays, added his quietly brilliant touch to his old Cornell professor William Strunk, Jr.'s The Elements of Style--now known as "Strunk and White"--and won over the world with his precise prose stylings in Letters of E.B. White. Melissa Sweet, Caldecott Honor artist of Jen Bryant's The Right Word: Roget and His Thesaurus and A River of Words: The Story of William Carlos Williams, has written and illustrated Some Writer!, the first-ever visual biography of E.B. White, with the blessing of his granddaughter, Martha White. Her enthusiastic afterword proclaims, "Here, in these pages, you will find the grandfather I remember so well, the man with a dachshund on his desk and his hands on a manual typewriter." 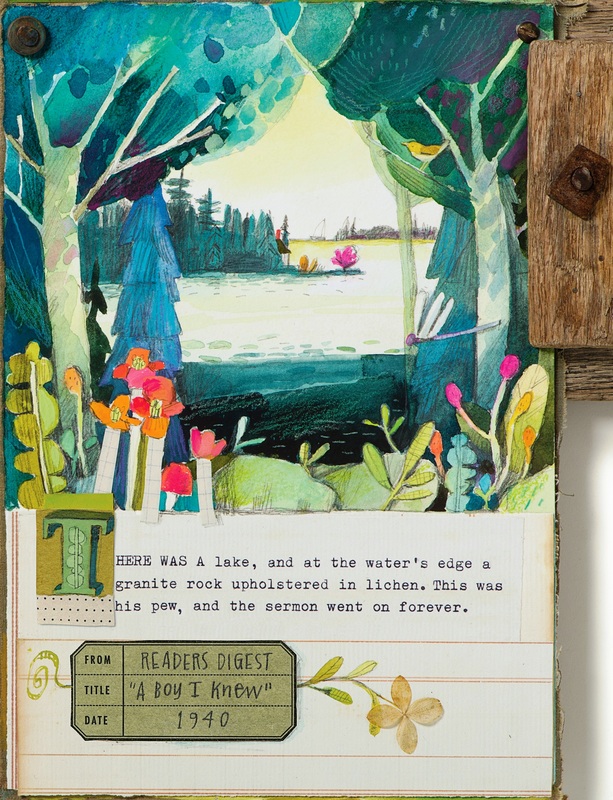 This "visual biography" is an elaborate scrapbook bursting with delightful, colorful collages made up of Sweet's charming original paintings, whimsical dioramas and maps; abundant family photos; paper ephemera; vintage office supplies; pieces of old books; chunks of barn; eggs; leaves; and old typewriter keys. The pages whisper "labor of love." In Sweet's "About the Art" note, she explains that she wanted to capture "the sense of place in White's writing and the small, vivid details he describes." She succeeds mightily, especially in reflecting the bucolic wonders of the 40 acres the Whites bought near Maine's Blue Hill Bay during the Depression, and the barn where the pig and spider of Charlotte's Web were born. In a clean, engaging style and "clear, brief, bold" sentences fit for an E.B. White biography, Sweet takes readers on a journey through his life, starting with White's earliest days, when, as he wrote in the Paris Review, he "suffered nothing except the routine terrors of childhood." It almost seems that Elwyn Brooks White--called "En," and, later, "Andy"--didn't have a chance not to be a writer. In his childhood home in New York, he learned to read when he was five with the New York Times, his dad made him look up unknown words, and at dinner he and his five siblings would finish the last lines of his father's limericks. Sweet gives White himself the floor quite often, peppering quotations from his books, journals and letters throughout, all thoroughly sourced. In a design decision representative of the book's thoughtful choreography, White's words are always typed on a manual typewriter, most often accompanied by identifying tags. He writes, "I discovered... that writing of the small things of the day, the trivial matters of the heart... was the only kind of creative work which I could accomplish with any sincerity or grace." In addition to behind-the-scenes glimpses of children's publishing, Sweet also illuminates White's New Yorker years, partly spent with the illustrious James Thurber, and the history of The Elements of Style, proving the now-classic Strunk and White primer is alive and well through a discussion of how contemporary children's book authors Kate DiCamillo, Joyce Sidman and Paul Fleischman still use it to shape their award-winning poetry and prose. Melissa Sweet is beloved for her wonderful picture books and charming mixed-media artwork. She received a Sibert Medal for Balloons Over Broadway: The True Story of the Puppeteer of Macy's Parade and The Right Word: Roget and His Thesaurus by Jen Bryant, and Caldecott Honors for The Right Word and A River of Words: The Story of William Carlos Williams by Jen Bryant. She is the author-illustrator of Some Writer! The Story of E.B. 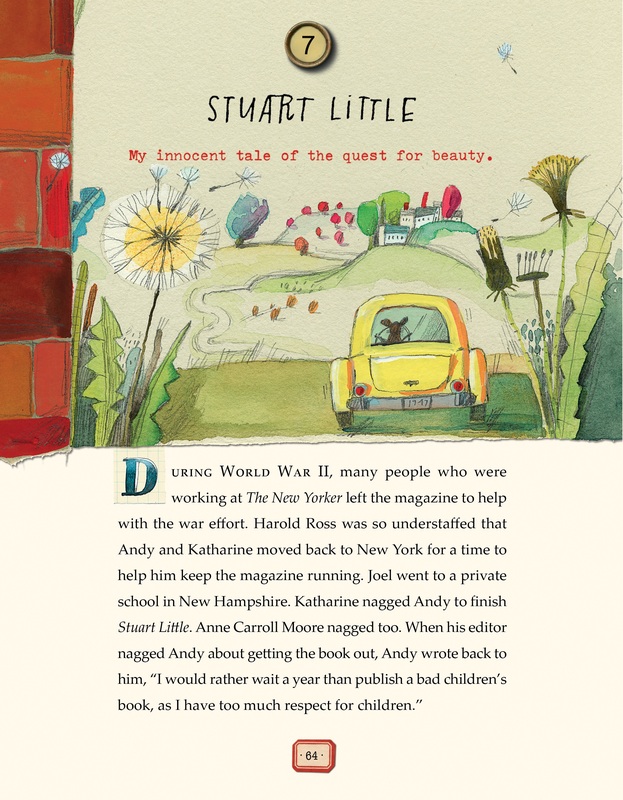 White (Houghton Mifflin Harcourt, October 4, 2016), the first fully illustrated biography of the legendary children's book author, the "White" in Strunk and White's The Elements of Style and New Yorker columnist. Sweet lives on the Maine coast, not far from a barn made famous by E.B. White's 1953 Newbery Honor Medalist Charlotte's Web. Here, Shelf Awareness pulled up a chair with Sweet at Chicago's Hotel Blake. In the spirit of Charlotte the spider, this interview has to begin with "Salutations." Did you read E.B. White's books as a child? I don't remember reading them, but when I started this book, I went to the library and got E.B. White reading Charlotte's Web on audio, and I drove to where he lived on the Maine shore. This was my inaugural road trip to be in touch with him. Soft research. It was amazing. Do you have a favorite E.B. White book now? If I had to be on a desert island, I think I would take Strunk and White's The Elements of Style. White's introduction, an essay originally written for the New Yorker, and his final chapter, "An Approach to Style," have such pithy advice for writing, and for living life. Second choice would be Charlotte's Web, because there's no way you could read that book, or hear it, too many times. There's something so fresh about it every time. Dad read us Maurice Sendak's Little Bear. Definitely Seuss. Homer Price. The Moffat family, for sure. But my reading of chapter books sort of fell off. We had The New Yorker Book of Cartoons and we read it inside and out, myself and my two brothers. Besides, I was busy making things. And selling them. So there was a big gap in my reading from chapter-book age until I became an adult. You made things and then sold them? I did. I'd make potholders on my loom and sell them. I had a doughnut delivery route. I'd set up in front of a grocery store with my table of craft projects. Kids sold lemonade, but I was a little more hard-core. What a nice segue into doing what I do! Was it your idea to create a visual biography of E.B. White? Yes. I was with my editor from Houghton, Ann Rider. We batted around some ideas and, when we met up at an ALA conference in Chicago, I said, "What if I wrote about E.B. White?" Ann then reached into her bag and pulled out Charlotte's Web. I asked, "Why do you have that?" And she said, "Well, I often read it when I travel because it gives me comfort." At that moment I was sure we were on the right track. The title--Some Writer!--reflects Charlotte the spider in Charlotte's Web, complimenting Wilbur the pig by saying "Some pig!" Were there any other titles in the running? I thought, "Maybe I should write a biography of E.B. White... he was some writer." And there was the title. There was never another possibility. It seems like the ideal reader for this book is someone who already loves E.B. White, be it adult or child. If you have that familiarity with his work, it's going to make the stories behind his stories more magical. Exactly. I hope kids come away wanting to read more E.B. White, open up his book of letters, scan some of the essays, use them somehow. For adults, I hope this book has relevance for those who grew up with his fiction as well as the New Yorker and The Elements of Style. Tell me about your decision to include so many quotations from White's books and his letters. When I set out to write this book, I saw right away that his essays and books and letters told the story better than I ever could. They were like a hinge, opening a door. So I was safe just letting him speak as often as I could, and as often as the story needed. I'm kind of a conduit. That's how I saw my role. This is an "authorized biography" in that you had the full support of White's family. Martha White, his granddaughter, lists many reasons in her afterword why you were the perfect person for the job, from the simple fact that you like dogs to her observation that there wasn't a "needless word" in any of your books, which is very E.B. White. I am completely indebted to Martha White. Some Writer! has a scrapbook feel--photos at an angle, typed quotations, your beautiful watercolors and mixed-media creations. How did you decide on this format? It started out as a picture book, for certain. But I didn't see how I could possibly fit his life into a picture book. Many design decisions were made to help readers navigate the archival material, the original artwork, the quotations. It's not random. Your collage work is gorgeous. Does your studio by chance look like the prettiest rat's nest in the world? That's funny. Well, it did for this book. 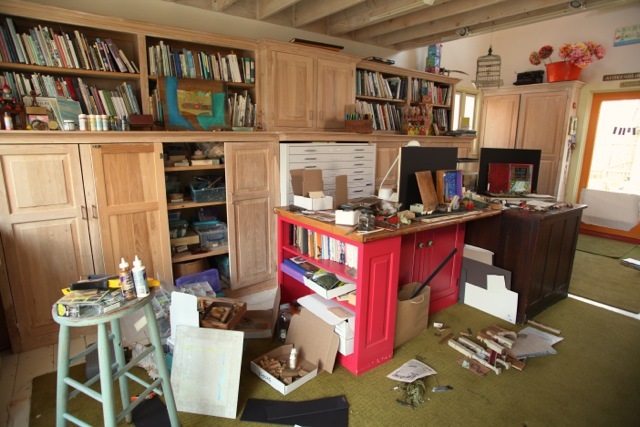 The good news/bad news with making collages is that your materials have to be all out, or you don't know what you need, and here it was all out, on every surface of my studio. People tell me they like coming in there, but for me it's a little hard to navigate when there's nowhere to walk and there are Exacto knives on the floor. How long did this book take to complete? I'm thinking it was three years from conception to ending, which doesn't even seem that long now. It was exciting to see Garth Williams's rough sketches for Charlotte's Web, as he tried to put a human face on Charlotte--"a loveable spider face"--with fangs. And the spider face inspired by the Mona Lisa! Wasn't that funny? He really struggled with it. I know there are many more of those sketches. And to think that E.B. White solved it by putting the two eyes and three hairs on Charlotte's head. Your biography really captured E.B. White's free spirit. He was focused on the freedom to express his ideas as he chose, but also just the freedom to live his own way. He even initially turned down a staff job at the New Yorker. He had that idyllic childhood, hopping on a trolley and going skating with a girl and playing pick-up hockey, I mean golly! He was so free. And that freedom he had as a kid carried over. He lived the life he wanted to live. It did him a world of good, to leave New York and go to Maine, to have the farm he always wanted. Does E.B. White inspire you? Oh gosh, yes. I think the thing he leaves me with is that idea of freedom we are talking about... and living life with conviction. Do I really want to take that on? Do I really want to go to that place? What is the work we want to do? E.B. White was able to keep all that in perspective. And I don't think I'll ever tire of his writing. I just keep going back to it. If you could ask E.B. White anything, what would you ask him?